Still relatively new this extraordinary perennial has so many fantastic attributes it will become indispensable in our gardens. 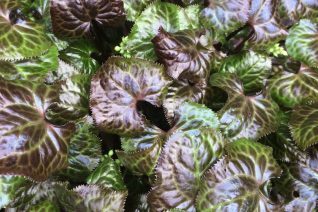 Glossy concave heart shaped leaves emerge tinted black before settling to a deep forest green. The dense foliage is seldom bothered by pests and appears to be slug/snail resistant. Throughout the growing season 2′ spikes emerge over the dome of dense foilage with small white flowers. The over effect is cool sophistication in the shade garden. Slowly expanding to 2′ wide. Rich, moisture retentive soil with regular summer irrigation. Mix with Hosta, Hakenochloa, Epimedium. Semi-evergreen.